The Koli are a large people group in western India and are a scheduled tribe. The word Koli means fisherman. One of their tribes is the Malhar Koli and they are endogamous, meaning they prefer to marry within their group. They are water carriers especially in the places where there is not much rain. The Koli of Gujarat are fishermen and laborers. They are not vegetarians and eat fish and rice. They speak, read and write in Gujarati. Monogamy is the way for them. Marriage is arranged through discussion. Divorce and marrying again is allowed. On the death of the father, property goes to the sons with the oldest son in charge of the home. The dead are cremated. They have a traditional council to look after them. Hinduism is their religion. They use government benefits that are available to them. 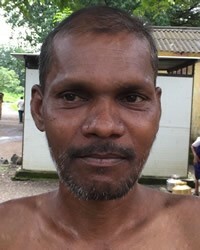 * Pray that the Koli traditional council leaders will come to Jesus Christ and lead others to Him. Singh, K. S., ed. 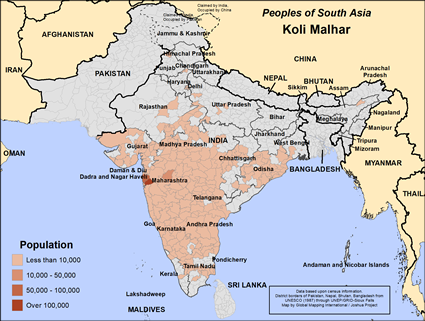 "India's Communities A-Z", Oxford University Press, USA 1999View Koli Malhar in all countries.